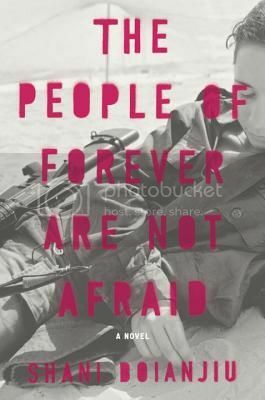 The People of Forever are Not Afraid is a powerful book. The girls all have difficult lives, and their time in the Israeli Army don’t make things any easier. If anything, one gets the feeling that the army has them even more screwed up than they were as children, and these psychological issues are something that they will pass down to their own children. None of the girls are particularly likeable, and in going between the three of them we don’t get to know any one of them overly well, but their vulnerabilities still make them characters with whom the reader can empathize, even if he or she has experienced nothing like seeing a coworker stabbed while guarding a checkpoint. The style of The People of Forever are Not Afraid can be challenging at times – it is not always immediately apparent which girl is the focus of a specific chapter – but it is a worthwhile read, both for the foreign-to-many experience it chronicles and for how compelling it makes the lives of these young women. Recommended. I need to add this to my TBR pile. Thank you for the review today! This does sound good, and I am in love with the title! I just received this book as a gift. It’s on the TBR list but not sure how quickly it will move up. I love reading about other cultures, especially getting a woman’s perspective. I like the premise of three women in three postings in the army and the similarities/differences in their perspectives from each other, and also from how an American woman might view things. I often find that multiple voices and perspectives are hard to follow at first but, like you said, are eventually some of the most rewarding stories, Thanks for this review. This book sounds really good! I’ve been to Israel, and my sister volunteered there for 6 months, spending one of those weeks in the Israeli army (although it was a week training type of thing, so she didn’t do anything crazy, just live the life of the soldiers). This book, while it might be a challenging read, sounds like something I would really enjoy! I have this, so I am glad it is good. I just need to find time to read it!